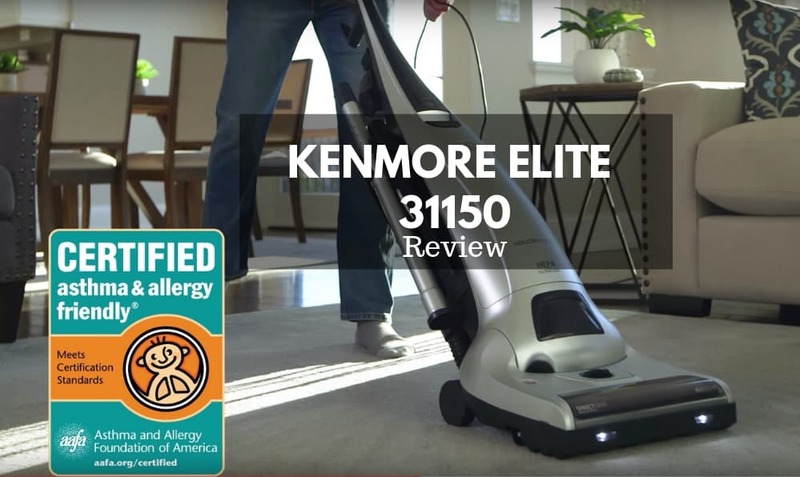 Kenmore Elite 31150 Pet Friendly Vacuum Review - Is It Worth It? Why choose A Kenmore Elite Vacuum? Who Is Kenmore Elite 31150 designed for? What Floor Surfaces Can It Be Used On? Who Makes Kenmore Upright Vacuums? Where To Buy This Kenmore Vacuum Cleaners? If you are looking for the complete upright vacuum with performance, brand and price being main considerations, then the Kenmore Elite pet-friendly 31150 could be just what you are looking for. A vacuum designed with pet owners and allergy sufferers in mind, but with much more. This stylish Kenmore vacuum is a model that will work on multiple floor types and has a super powerful motor to handle the thickest carpets like shag pile but will work equally as well on wood and laminate floors. It's not the lightest upright vacuum on the market, so let's go through the pros and cons of this Kenmore Elite 31150 to see if it lives up to all the hype, and see if it's the best one for you to buy. Because it comes with a pet attachment tool for removing hair from furniture and pet beds, the Kenmore elite will benefit pet owners, but with a bagged design system and HEPA filter, it allows it to have many benefits which make it suitable for many homeowners. If you have multi floors surfaces like hardwood or carpet, the Kenmore Elite 31150 has five adjustable height settings to adapt to your floor type. We found the medium setting worked great on low pile and hard surfaces without needing to adjust the settings, and this picked up small to large sized debris, like sand and cheerios without any problems. That being the case, once you find the right setting for your floors, you shouldn't have to adjust these settings too often, but it's still a nice feature to have available. The ON/OFF switch is conveniently situated on the handle of this pet-friendly vacuum, and can only be used when the handle is released from the upright locking position. The brush roll can be turned OFF from a button on the handle, making the natural transition from carpet to hard floors a smooth process. When it comes to suction power, this model certainly ticks all the boxes. With a 3D inducer motor attached, it gives the Kenmore Elite 31150 a fantastic amount of suction. When tested, it was found to be 40% more powerful than a Dyson Animal 2, which is the most powerful vacuum in the Dyson range. Add to this the ability to change the height settings, then this gives you a more significant amount of power and flexibility to adjust to the floor surfaces in your home. Most vacuum cleaners don't have adjustable or the option to remove the cleaning head. The brush roll on this model can be switched off via the handle for hardwood floors, which is an excellent option for users with thicker type areas rugs. The brush roll motor works by vibration, and this movement dislodges any dirt from deep within the carpet. For high pile carpet, it can be switched off, or the height setting can be adjusted. This will stop any damage to long fibres of this type of carpet. NOTE: If you are cleaning area rugs on hard floors, the vibrating agitators can remove debris from under the rug. The movement on top of the carpet moves particles by moving it along towards the edges of the rug and picks it up from the sides. Watch it in action on the video clip below, and see for yourself. Another great thing is instead of having to roll the carpet back to clean underneath, this method does both at the same time. This sounds a bit like a gimmick, kind of an extra feature for extra's sake, But surprisingly it does work and here's why. A lot of the time when you are vacuuming, you keep going over the same areas several times to make sure it's clean. However with the Elites dirt sensor, when dirt passes through the suction ports, the sensor lights up to let you know it's collecting debris from the floor. Therefore once the area is clean and free from debris, the light goes off letting you know it's completely clean. This is a great option to have to help focus on areas that need more attention when cleaning, plus is a big time saver. 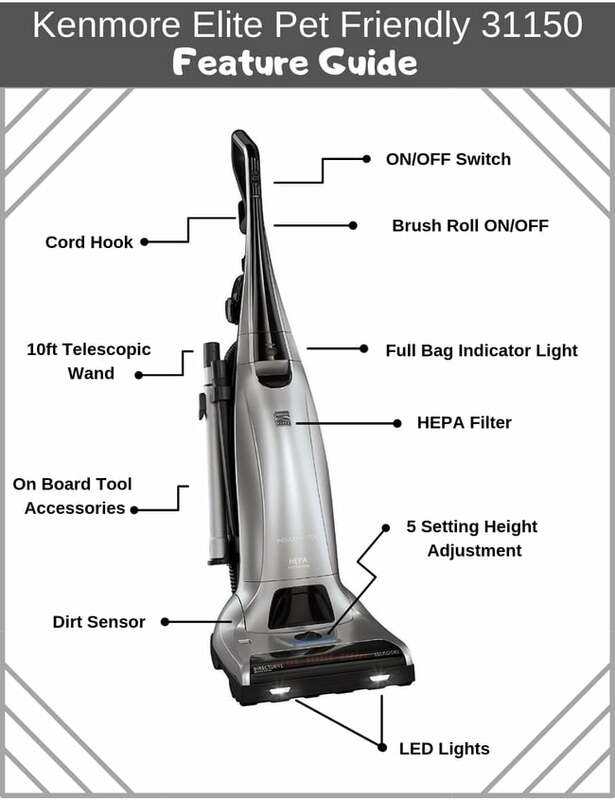 The vacuum has a handy light to let you know when the HEPA cloth bag is full and needs emptying. This is controlled by the air flow, and will also help if you have a problem with a blockage on the vacuum, as the light will come on alerting you to the problem. The cleaning path is a sensible 14 inches, giving plenty of coverage when in use, which when using in large rooms will allow quicker vacuuming of the space. The front LEDs light will shine the way into even the darkest areas, ensuring that you pick up every last crumb. 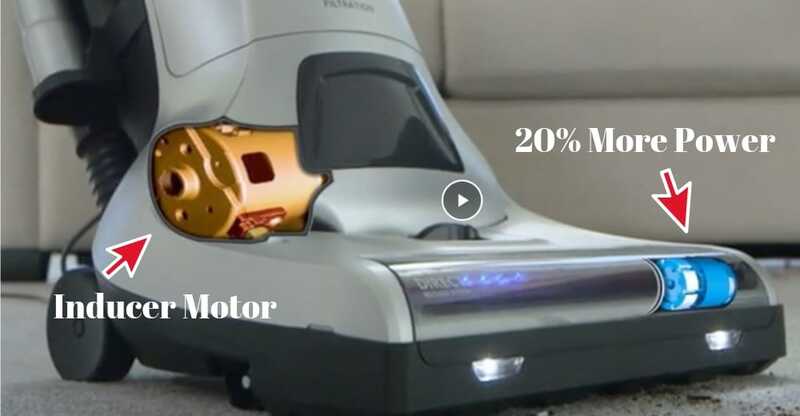 The Elite is not a lightweight vacuum, weighing over 21lbs, so while this doesn't affect its use when pushing it when it comes to cleaning it, it could be a problem for a multi-level home. Therefore if you want to use it on a large stairway, or need to move it up to different room levels, it could become a tiresome job. So this would be something you need to take into consideration. 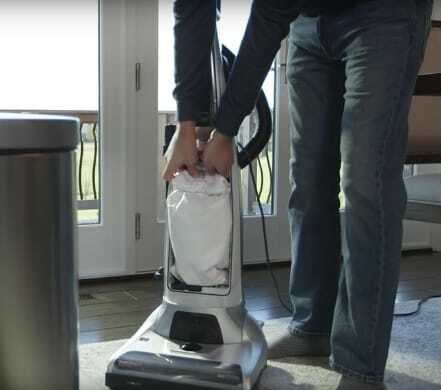 There can be advantages and disadvantages with having a bagged vacuum, and the Kenmore elite vacuum is fitted with a HEPA cloth bag which allows it to perform at the highest level of protection and is certified by the Asthma and Allergy Foundation of America. Couple this sealed cloth bag system with the HEPA filter and this bagged vacuum system is a reliable solution for maintaining a clean air environment in the home. For emptying, once the indicator light lets you know its full the bag should be taken to the trash. Don't reuse the dust bags, place them into a further plastic bag is advisable to prevent dust come back into the air. Then get out a new bag and replace them by folding the safety seal tab on the new bag and slotting it back into place on the vacuum. Along with the cloth bag HEPA filter, there is also a cartridge type HEPA filter that plays a significant role in keeping the air dust free and clean when using and after use of the vacuum cleaner. The HEPA filter will capture microscopic particles down to 99.8%, which is ideally suited for allergy sufferers or homes with Asthmatics. The filter has a micron screen which will filter away and remove pollens, mites and pet hair. The filter is generally replaced after 12 months, so the cost for the piece of mind of having clean air is not so much. They average around $6 -$8 for replacement filters, which come in packs of two and readily available from Sears, and Amazon. 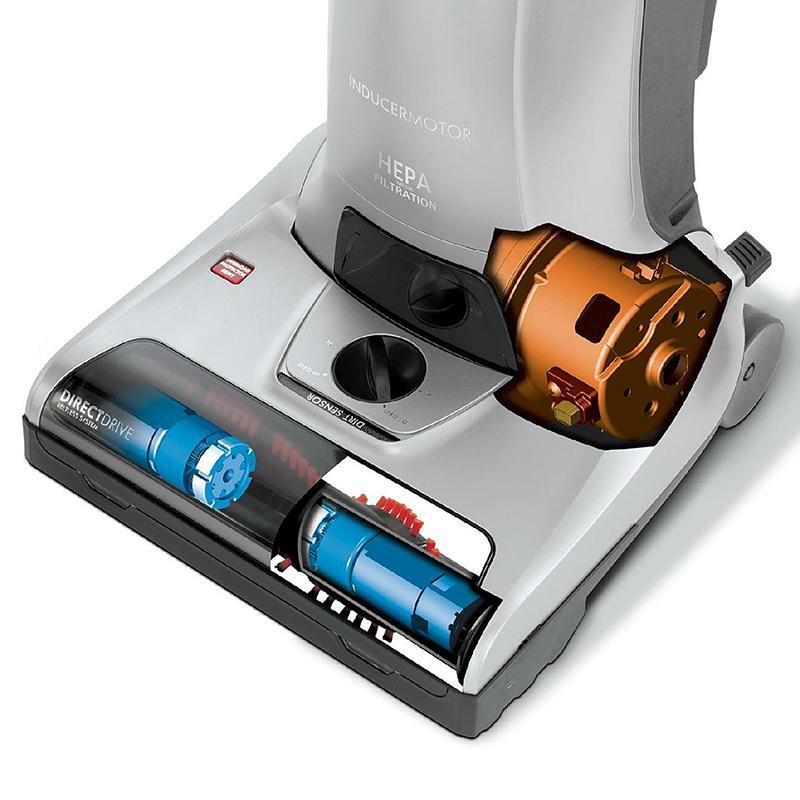 The onboard tool accessories are stored on the back and sides of the upright vacuum. The telescopic wand attachment extends to 10ft, and when connected to the hose will able to handle hard to reach areas like drapes and ceiling fans. Add the crevice tool, and you can clean kickboards and all corners and edges of your rooms. The pet handimate brush can be used with the hose for pet hair on upholstery and bedding. We found the pet brush to be a bit disappointing and saw the simple combination brush did a better job. It looked a bit over-designed and was prone to tangling up with hair whereas the combination brush had less moving parts and required less cleaning. Another plus was the hose has a neat slider for controlling the suction to the cleaning head. It's useful if you want to increase or decrease the suction for different fabric types. For an upright vacuum model, we found Kenmore 31150 easy to move around with a sleek design, and it manoeuvred around chairs and furniture reasonably well. As for laying flat for cleaning under furniture, it was only able to go under up to six inches, which is a common problem when using upright vacuums. However, the hose and wand attachment tools can be used in these hard to reach areas. We found that the length of the hose was not particularly useful when it came to stairs as it only reaches halfway up, which is a concern with the weight of the vacuum having to move it upstairs to finish the job. Perhaps it's not a problem for some, and maybe we're a bit unfair, but we thought it best to point this out, as it may not suit you. The suction power on carpet and hard floors was exceptional, and picking up large and small items with minimum passes was impressive. With all its features overall we thought it was a good vacuum if you like uprights, and are happy to deal with the weight of this Kenmore 31150 cleaner. When it comes to value for money, then this Kenmore elite pet-friendly 31150 is well priced amongst its competition. With lots of great features and one of the highest powered suction motors on the market, this model sits in the price range of a great buy if it meets all your requirements. The 31140 is a model to consider. Still, an upright vacuum, the main differences between these two are the 31140 motors, which is not as powerful but is slightly lighter in weight by a few lbs. Performance wise there is little between them. The 31140 does not have the dirt detector, and the cord length is shorter by 5 feet. There is not a lot of variation in the price either between these two models. The upright power line from Miele could be worth checking out. A higher price model with 1500 watt motor and large cleaning area of 14 meters without having to replug. This cleaner uses a hygiene shutter system which helps with clean air. It is designed to lay flat, so it would be better at getting under beds and furniture. The height adjustment is manual with a pedal at the bottom rear of the machine. This cheaper model from Hoover is a bagless upright cleaner, has some cool features and if you don't fancy the bagged HEPA style of the Kenmore than taking a look at this one might be the solution for you. Kenmore has been synonymous with producing household vacuum cleaners since 1932 for the US marketplace. The products were sold through Retailer chain Sears over the following decades and joined the online revolution by selling on Amazon in 2017. Panasonic manufactured the Elite range of Kenmore vacuums in their factories in North America up until 2016. However, Panasonic is scaling down its production due to costs. So this has now been outsourced and is now produced in China by Cleva who Kenmore partnered with in 2017 to create the latest Kenmore vacuum cleaner models. The Kenmore 31140 elite can be purchased from many retail outlets including Kmart, Sears and Amazon. Q - How many filter bag does this come with? A - It come with one cloth bag and one HEPA filter. Q - What are the wheels made off? A - The wheels are hard plastic with rubber coverings. Q - What it like for stairs carpets? A - The hose is too short for stairs, however you can get an extension hose which will help. Q - How long is the warranty on this Elite Pet-Friendly Vacuum. A - The standard warranty is for one year. Q - What type of replacement bags are best to use? A - Try these ENVIROCARE- allergen vacuum bag available from Amazon. If you are searching for an upright vacuum cleaner packed full of features from one of the leading brands, then Kenmore indeed is a safe bet. The elite pet-friendly 31150 works excellently on all types of floors but excels on hardwood and tile. PLus you're buying from a brand with decades of experience in the appliance industry. The choice of vacuum for your home is an important one, and you won't go far wrong a vacuum from Kenmore, and we're sure you won't be disappointed.